Students at Catalyst Maria High School will soon unveil one of their most poignant plays called I Dreamed a Dream where they will explore issues of identity, teen pregnancy, and struggles undocumented students face. Drama Director and Playwright Andrea Mear says this is one play students are eager to share with the community. Is it Mear’s hope this play brings attention to the ACCESS bill and the importance of equal opportunity for undocumented students. Mear set aside time before the grand opening to talk to Lawndale Bilingual Newspaper about I Dreamed a Dream. Catalyst Maria High School is about to unveil its latest play, I Dreamed a Dream in a few weeks. The play touches upon various themes in the lives of four students. Can you talk to me about these themes and the process of putting this play together? Andrea Mear: The main theme is perseverance. All of the characters in the play face some big life altering obstacles and with the help of their friends, they learn to find the strength to fight back and take control of their lives. My plays are always inspired by the struggles that our students face. I was inspired to write about undocumented students after our Dreamers group shared some of their own stories of coming to the country and all of the anxiety they feel about an uncertain future. Once the script was written, we had auditions and started rehearsals immediately. This show also is a way to showcase our students that participate in the fine arts. We feature all kinds of student artists: poets, writers, singers, and actors. What did the students enjoy most about creating this play? They love delving into the characters and talking about real life connections or how the themes are universal. 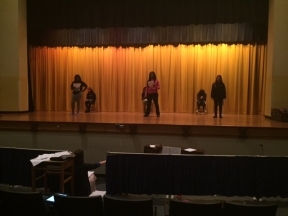 This is the first time that CMHS is producing a play with music, so they have enjoyed the choreography and the music rehearsals. 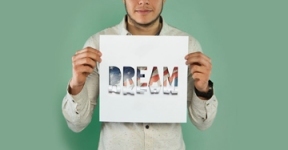 They also want to help showcase the Dreamers and all the hard work that they are putting into making the public aware of the inequities of education for undocumented students. 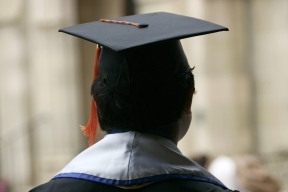 Were there topics too difficult or emotional for students to pursue? There is one scene where the dialogue is xenophobic and misogynistic and we had to breakdown character motivation and talk through how this scene is necessary for the characters to “rise up” at the end of the show. The cast has done an excellent job working through the text and making it meaningful. 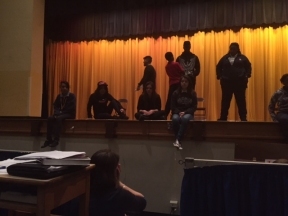 Last fall, Catalyst Maria High School held a play about gang violence and this year students are touching upon personal themes, how do you hope these plays sparks dialogue? Last fall CBS news covered our show because of the subject matter and that sparked a schoolwide dialogue about street violence and neighborhood culture vs school culture. I am hoping that this play not only inspires students to keep working toward their goals despite the obstacles that arise, but also that it inspires everyone to get behind the ACCESS bill and help our undocumented students have access to postsecondary education. Catalyst Maria High School also has a Dreamers Club, talk a little more about how that club is shaping the lives of the students? Our Dreamers club was started by our amazing counselor Carly Comiskey. The club provides undocumented students with encouragement, support, practical advice, and resources to help build their futures. Also, it creates a forum for all students and staff to advocate for immigrant rights and justice. Making Catalyst Maria as Dreamer Friendly as possible. What do you hope people take away from viewing I Dreamed a Dream? I want this play to showcase our multi-talented students and our growing performing arts program. We want to give the dreamers a stage to bring more awareness to their cause and the importance of the ACCESS bill. The play will take place on June 2nd and 3rd at 7pm at Catalyst Maria High School located at 6727 S. California. Tickets are $5 at the door. All proceeds go to fund the Drama Club’s next production.